A kinegram (pronounced "KIN-uh-gram") is a moving picture you can make with paper and plastic. The word comes from "kine-" meaning "moving" and "-gram" meaning "drawing". A kinegram has two parts: (1) an underlying picture with a complicated striped pattern and (2) an overlay of alternating clear and solid stripes on a sheet of clear plastic. When the overlay is moved up and down in front of the picture, you will see the motion, such as wheels turning or circles expanding and contracting. Kinegrams are related to Moiré (pronounced "MWA-ray") patterns, which are the patterns you see when look through two window screens. You can view these kinegrams using paper and plastic, or using the computer. The cool thing about kinegrams is that the picture moves using just a sheet of paper and a sheet of plastic, without a computer! Step 1: Print the kinegrams on paper. Here are several kinegrams in printable Adobe Acrobat PDF files. Printable Kinegrams 1 (PDF). Basic kinegram patterns to cut and paste. Printable Kinegrams 2 (PDF). More kinegrams. 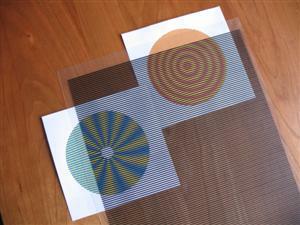 Step 2: Print the striped overlay pattern on a sheet of clear plastic. You can get printable clear plastic at an office supply store. If you cannot print directly onto clear plastic, then you can print the overlay on paper and then photocopy it onto clear plastic. Here are several printable overlays in Adobe Acrobat PDF files. The thickness of the clear stripes are different, but the overall spacing is the same, so all these overlays will work on all these kinegrams. Thinner clear stripes will make the kinegram appear sharper but dimmer; whereas thicker clear stripes will make the kinegram appear brighter but blurrier. Printable Overlay 50% (1/2 clear) (PDF). Makes image bright but blurry. Printable Overlay 33% (1/3 clear) (PDF). Makes image medium bright and medium sharp. Printable Overlay 16% (1/6 clear) (PDF). Makes image dim but sharp. Printable Overlay 08% (1/12 clear) (PDF). Makes image very dim but very sharp. Step 3: Move the overlay slowly up and down in front of the kinegram and you should see the motion, such as wheels turning, etc. The overlay must be lined up precisely with the kinegram. It is helpful to make a sleeve of folded paper to keep the overlay straight. Important Info about Printing Scale: The overlay must be printed at the exact same print size scale as the underlying kinegrams. It is best to print the Adobe Acrobat PDF files provided here, rather than printing the GIF or PNG images from the web page, because you can better control the print size scale. Print the PDF files at 100% scale if possible. If you reduce or enlarge anything, then you must reduce or enlarge all the kinegrams and the overlay by the exact same percentage. To help you check the scale of your printouts, most of the kinegrams on these pages have alignment marks (tiny blue dots on the left and right sides) that should exactly match the overlay spacing. Drag the striped overlay slowly over the pictures to make them move. Click the buttons to show the overlay and adjust its appearance. Click the "Show" button to fetch the overlay and make it visible. Click the "Hide" button to make it invisible. Click the black, gray, or white buttons to change the overlay color. Click the size buttons to change the size of the clear stripes. You can select 50%, 33%, 16%, or 8% clear. Select larger clear stripes for a brighter image; select smaller clear stripes for a sharper image. 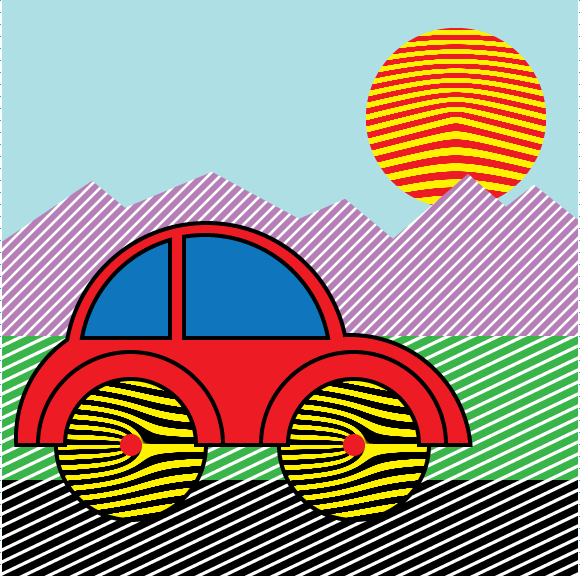 When the striped overlay is moved up and down in front of this kinegram, the wheels of the car will turn, the road will move horizontally, and the sun will pulse in or out. Kinegrams 1 (web page). Basic kinegram patterns. Kinegrams 2 (web page). More kinegrams. You can make your own kinegram scenes including funny faces, vehicles, abstract patterns, etc. by printing the kinegram patterns on paper and cutting and pasting them into a big picture, like a collage. It's fun to make your own cut-and-paste kinegram birthday cards or other holiday cards. You can do the cutting and pasting literally with paper, scissors, and glue, or you can do it on the computer in your favorite drawing/painting application. Most of the kinegram patterns on these pages have a preferred horizontal direction, which must match the horizontal stripes of the overlay. If you are using scissors and glue (not a computer) to combine pictures, then be careful to line up the pieces exactly. Do not change the size of the kinegrams or the overlay. If you reduce or enlarge anything, then you must reduce or enlarge all the kinegrams and the overlay by the exact same percentage. Do not rotate the pieces. You may mirror the pieces. You may change the colors. For more info about this kind of animation, search the web for "kinegram", "scanimation", "lenticular sheet", "lenticular screen", or "lenticular lens". You can make your own new kinegram animations if you are a skillful user of a computer drawing or painting application. There are detailed instructions here: Making Kinegram Animations.